Owning a residential rental property can be a lucrative investment, but it also carries with it its share of headaches and worries. Finding a skilled Atlanta residential property manager can save you a lot of time and money. With our full service Atlanta property management, you get much more than just one over-worked property manager. You get a full team of skilled professionals with the expertise to provide you with the highest level of service and the maximum return on your investment. We are a full service property management company managing homes in 18 counties surrounding Atlanta. Our company takes pride in being active participants in NARPM (National Association for Residential Property Managers) and continuing our education to stay current in the changing market. Our Atlanta area property managers will safeguard your property, manage your tenants, and protect your investment, all without you having to lift a finger. You'll be amazed at how much time and money our residential property management services can save you in both the long and short term. Our Atlanta apartment property management services include all necessary maintenance, tenant screening & management, and regular property inspections. Whether you own one unit or many in an apartment building, our Atlanta property managers can handle it all. Providing a licensed Realtor or prospective tenant access to your vacant rentals when they need it is a very effective way to get your rentals leased quickly. This is called self-access, and when done using our electronic lockboxes and one-time use codes it is both quick and secure. We use Tenant Turner to qualify prospective tenants against the leasing restrictions of your rental and to authorize Realtors. All access is monitored, and our team is notified each time an authorized person arrives at your rental and requests an access code. Only those who have been pre-qualified or pre-approved for entry into your rental are given an access code, the code can used only once and only on the day for which they are generated. Realtors can use a Realtor-only link provided through the Multiple Listing Service (MLS) that allows them to easily schedule a showing without having to call our office and coordinate a time. Prospective tenants can schedule self-access to your vacant rentals after they have provided verifiable contact information, qualified against the leasing restrictions (e.g. pet policy, income requirements, etc. ), and provided a copy of their government issued ID. After a Realtor or prospective tenant views your property, they are asked to fill out an application or provide feedback which we pass on to you and use to make any corrections which will make your rental more attractive & reduce your vacancy period. Our branded vehicles direct tenants to our website...and often get us stopped in parking lots! A sign & Lock-box placed on the property within 24 hours. All properties are listed on 25+ additional websites & several “feeder” sites providing great exposure. You will receive regular showing reports & tenant feedback that will help provide solutions to reduce your vacancy period. Get started with PMI Georgia. If you're thinking about renting out your house, it's important to set a rent that will cover your costs, earn you a profit, minimize vacancies and provide value to your tenants. It's tempting to ask for a very high rent, and occasionally you will find someone who will pay it--but generally you will need to appeal to a wider audience by charging a rent more in line with the market value. There is an incredible opportunity to purchase homes in Atlanta well below the cost to build, but the window is beginning to close. Foreclosures are beginning to slow and new building has started. But it is NOT too late! Contact us today to build your investment portfolio & generate passive income for life. Great investment opportunities are available right now! The metro Atlanta region is home to more than 5.3 million people and nearly 150,000 businesses, a world-class airport, multiple parks and green space, competitive schools and numerous amenities for entertainment, sports and restaurants that all offer a top-tier quality of life. From its diverse economy, global access, abundant talent and low costs of business and lifestyle, metro Atlanta is a great place to call "home." Residents have easy access to arts, culture, sports and nightlife, and can experience all four seasons, with mild winters that rarely require a snow shovel. 9th-largest metro area in the U.S.
Atlanta has the highest elevation out of major cities east of the Mississippi River. Atlanta's high elevation distinguishes it from most other southern and eastern cities, and contributes to a more temperate climate than is found in cities at similar latitudes. Atlanta is divided into 242 officially defined neighborhoods. 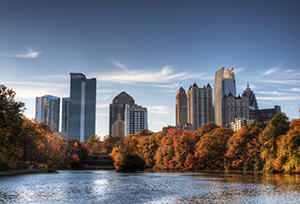 The city contains three major high-rise districts, which form a north-south axis along Peachtree: Downtown, Midtown, and Buckhead. Surrounding these high-density districts are leafy, low-density neighborhoods, most of which are dominated by single-family homes. Downtown Atlanta contains the most office space in the metro area, much of it occupied by government entities. Downtown is also home to the city’s sporting venues and many of its tourist attractions. Midtown Atlanta is the city’s second-largest business district, containing the offices of many of the region’s law firms. Midtown is also known for its art institutions, cultural attractions, institutions of higher education, and dense form. Buckhead, the city’s uptown district, is eight miles north of Downtown and the city’s third-largest business district. The district is marked by an urbanized core along Peachtree Road, surrounded by suburban single-family neighborhoods situated among dense forests and rolling hills. As a national center for the arts, Atlanta is home to significant art museums and institutions. The renowned High Museum of Art is arguably the South’s leading art museum and among the most-visited art museums in the world.